All manatee tours are approximately 4 hours long. We will embark on a scenic river tour, to an area of fresh-water springs, where you will swim with manatees. When we arrive at the springs, you are encouraged to swim in the water for an up-close experience with the manatees. If you prefer not to swim with manatees, you can remain on board and view the manatees from our tour boat. Manatees are gentle mammals. They do not pose a threat or danger. Small children can even swim with manatees as long as they are safe being in water. Manatee Tours Are Available All Year. Manatee Tours are $75 per person. There’s a $225.00 minimum. Remember, you will have the tour boat all to yourselves. *At least 72 hours notice required for cancellations. Snorkeling gear & wetsuits included with our manatee tours. Bring along an underwater camera if you can. Bring an underwater video camera if you can. Manatee tours for large groups is also our specialty. Please call and we will make arrangements for your large group to swim with manatees. When you swim with manatees, you will feel the urge to swim towards or after the manatees, but we ask that you resist the urge to do so. Chasing manatees is considered harassment and is actually against the law. Manatees are usually very curious by nature and it is common for them to swim near you. So be patient and you should get plenty of close-up views of the manatees. If they come right up close to you, it is fine to hold out your hand and gently touch them. We all cherish the time we get to swim with manatees. They are so friendly, curious and gentle. They are downright adorable. We all hope that they continue to flourish for generations to come! Respecting them by respecting the rules will help them with their struggle for existence. For your information, manatees are an endangered species, protected under the Federal Endangered Species Act. Manatees are also protected under the Federal Marine Mammal Protection Act. Both of these laws make it illegal to “take” (i.e., harm, harass, injure, kill, etc.) manatees. Manatees are also protected under the Florida Manatee Sanctuary Act. A state policy in 1989 further identified 13 “key counties”, paticularly Citrus County, which needed to develop manatee protection plans. Can anyone swim with manatees? Is it safe to swim with manatees? Yes, it is quite safe to swim with manatees. They are very gentle by nature and move slowly in the water, when not resting or sleeping on the bottom. Young manatees are interestingly curious and playful at heart. When is the best time to swim with manatees? The best time is during winter months, because there are several hundred manatees in the area. However, manatee tours are available year-round. The best time of the day is during daylight. Mid-morning through mid-afternoon provides the best visibility. Where is the best place to swim with manatees? The best place to swim with manatees is at one of our popular fresh-water springs, such as Three Sisters Springs. 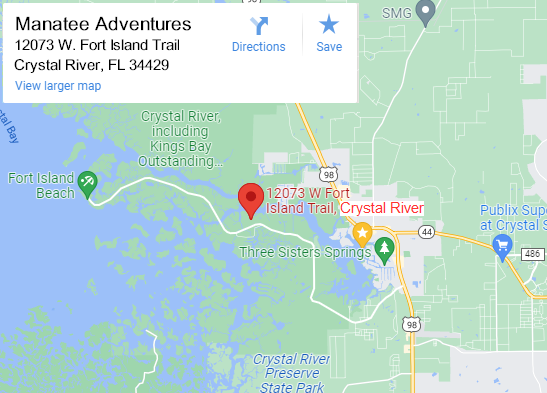 You will need a boat or kayak to reach the springs by water. Wearing a mask and snorkel makes the experience much easier and more enjoyable. We had a wonderful time. The kids keep talking about the manatees and made us promise to come back again sometime. A big thank you to all of you! Ann M.
Just letting you know that our family really enjoyed the tour. We're so glad we went with you and we hope we come back to Crystal River again soon! Paul A. A sincere thank you for making special arrangements for our group. Everyone had a great time and the kids had a blast. The pictures we took turned out fantastic and we plan to do it again in a few years. Thank YOU! Andreas W.